DAVID Ranson is a priest of the Broken Bay diocese and a respected writer and lecturer in the fields of spirituality and pastoral formation. He has worked for many years with ordained ministers “seeking to assist them to identify the core of their priestly heart … leading them to listen deeply to their experience, and to identify the moments in the course of their priestly experience when they felt most ‘awake'”. This is consistent with his belief that being spiritual means being attentive to life. In the book under review the author draws on material he presented at Easter time last year at Blenheim to the New Zealand National Assembly of Diocesan Priests. 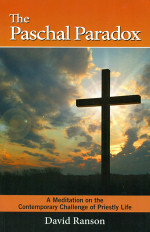 Subtitled A Meditation on the Contemporary Challenge of Priestly Life, it links the mystery which lies at the heart of our faith – the extraordinary paradox of how abundant life has come to the whole of humankind through the death and resurrection of Jesus – to the complex demands and delights of the priesthood in today’s world. Writing in a rather conversational vein, Fr Ranson focuses mainly on the passages from John 21 which are read during the liturgical season of Easter. Like an experienced teacher he uses anecdotes to good effect and adds colour and depth to his writing by drawing on the insights of other writers as diverse as Johannes B Metz, Karl Rahner, Michael Leunig and Robyn Davidson (“the camel lady”). I especially liked his treatment of spiritual leadership and his related reflections on grief, hope and mercy. Also helpful to this reader was the distinction he made between fantasy and imagination and his treatment of “spiritual nomadism”. Paschal Paradox is a work that I warmly recommend to priests and ministers of all Christian denominations and to men and women generally who are exercising roles in ministry.